Monocular heads: Here you can only use one eye for viewing. Many educational microscopes have monocular heads, as they are the cheapest of all types. Binocular heads: These are standard for stereo microscopes. Compound microscopes can also have them, but the image produced is not stereoscopic. Binocular microscopes are much more comfortable for long-term viewing. The inter-pupillary distance can be adjusted by moving the eyepieces either apart or together. Binocular microscopes also have a possibility to do a diopter adjustment, in case the two eyes are not equally good. Trinocular heads: These have a third tube for the attachment of a camera. You also need a camera adapter in order to do photography. Stereo microscopes (left) have a binocular head. 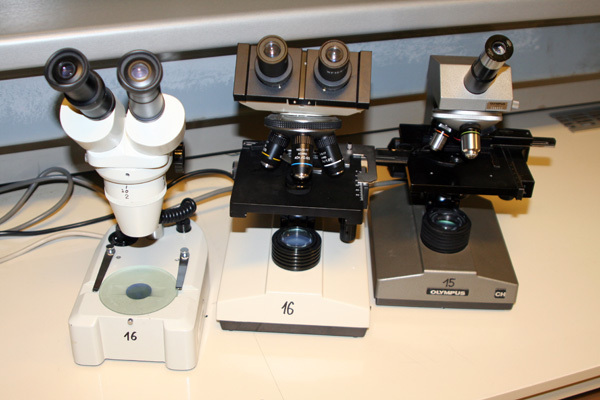 Conventional compound microscopes (center and right) can either have monocular or binocular heads.